The craziest thing happened the other day; one of our executives walked into the office and started throwing money at us for doing our normal job. 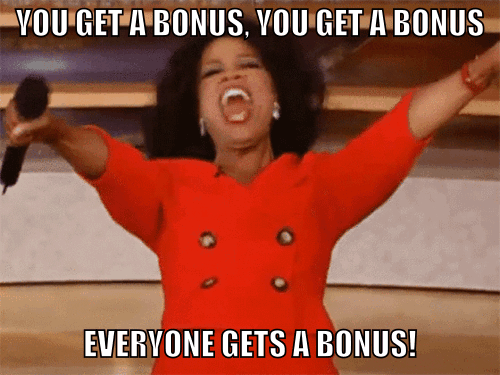 It was like Oprah, “you get a bonus, and you get a bonus, and you get a bonus, EVERYBODY GETS A BONUS!” But then I woke up in my bed and realized it was 3 a.m. on a Tuesday. However, my dream wasn’t too far from reality around here these days, especially, in favor of our potential and current partners. TAMCO launched TAMCOnnect Plus recently, a new partner program that is more of a giving program, which offers a whole new twist for the unified communications, telecommunication and technology solution provider. TAMCO has completely abandoned the greed ship and decided to open its wallet for the taking. TAMCOnnect Plus partners are literally given a percentage of our own profits for each technology solution sale procured with an operating expense (OPEX) or traditional lease. So you really do get a bonus with each sale! TAMCOnnect Plus takes an entirely different approach to make offering leasing more enticing. The program continues to offer all of the original value our partnership has always provided. However, now there is a new focus of contributing directly and significantly to partners’ gross margin. Setting aside the ability to win incremental business, simply by positioning a different way for customers to pay for their telecommunications, unified communications, or other related technology solutions, the TAMCOnnect Plus program enables partners to realize more margins on the sales they will already win.